In my November post on street design I have pointed at certain features of modern Russian architecture that undermine the creation of good public spaces. Namely I mentioned deep setbacks between buildings and the right-of-way that are used as parking lots. Thus buildings face the street not with pedestrian-friendly frontages but with hoods and tailpipes of parked cars. The difference between pedestrian-oriented and car-oriented development is not usually striking to a passer-by. It is a background that creates a certain atmosphere in the city or on particular streets. Like stuffiness in a room – one wouldn’t notice how stifling it was until the window is opened. To ‘open the window’ and illustrate the difference between pedestian- and car-oriented buildings I’ve created pairs of photographs showing the same places but with different placement of buildings relative to the street. Let’s have a look! This entry was posted in Development on February 10, 2016 by Vladimir Zlokazov. What is wrong with the new tramway line to Akademicheskiy? Early in November a news report appeared on the official site of Yekateriburg city hall about a technical consultation that took place, on the topic of the new tramway line that’s being designed to Akademicheskiy neighborhood. The report contained several details that are worthy of analysis. It was not stated explicitly in the article of course but the new line is likely to have features that would cause plenty of troubles for the residents of Akademicheskiy and South-West neighborhoods. Firstly during the construction phase and then, most importanly, in terms of how transit service would have to be planned along this new line. This entry was posted in Public Transport and tagged akademicheskiy, public transport, tramway, transit on December 23, 2015 by Vladimir Zlokazov. In Yekaterinburg (as well as in other Russian cities) town planners have have forgotten how to build urban streets. It’s a pity, given that the public space of the city mainly consists of streets and it’s the streets that most of us urban dwellers have to deal with everyday. If we don’t get the streets right we will have little chance of building a truly livable city. First of all it is necessary to define the street. For the purposes of this text I propose the following definition. A street is a multifunctional linear public space formed by buildings’ frontages. That definition itself holds the problems that we’re going to discuss. This entry was posted in Urban planning and tagged public space, streets, urbanism on November 12, 2015 by Vladimir Zlokazov. Bolshakova street is a west-east corridor in the southern part of Yekaterinburg’s central district. Potentially it can be a very important bicycle route as it is the only way in the foreseeable future to connect South-West district and the new Akademicheskii district to the downtown. In 2011 the city initiated a plan to widen the street to full 4 lanes with right-turning lanes at intersections. The original project was only about widening the carriageway and leaving the rest of the street, including crumbling sidewalks, as it was then. That didn’t seem right to me as I thought that improvements should be addressed to all the street users and not just the motorists. I started a campaign proposing to improve the public realm and to include bicycle paths into the plan. Rather suprisingly this campaign succeded. In October 2012 the city placed an order for a new project of this street. The technical assignment included a point that stated that the engineers were to take my design propasal into consideration which by that time was in a form of CAD-drawing, ready to become a base for the real project. Unfortunately 6 months of negotiations ended-up with almost nothing. The final project was primarily car-oriented, the bicycle part being one big compromise and the pedestrian realm left almost unattended. Neither the city officials, nor the engineering company that won the project had the ambition to do anything above the average level of design in Russia. So the only option left to me was to transform my drawings into a comprehensible form and turn to public again. Below you can see 3-dimensional renderings of Bolshakova street between Moskovskaya and 8 Marta streets (best viewed in full-screen mode). The intention of this post is to attract some international attention to this project and collect reviews of people interested in bicycle infrastructure from around the world. So, if you have something to say, you are more than welcome! This entry was posted in Projects on June 6, 2013 by Vladimir Zlokazov. 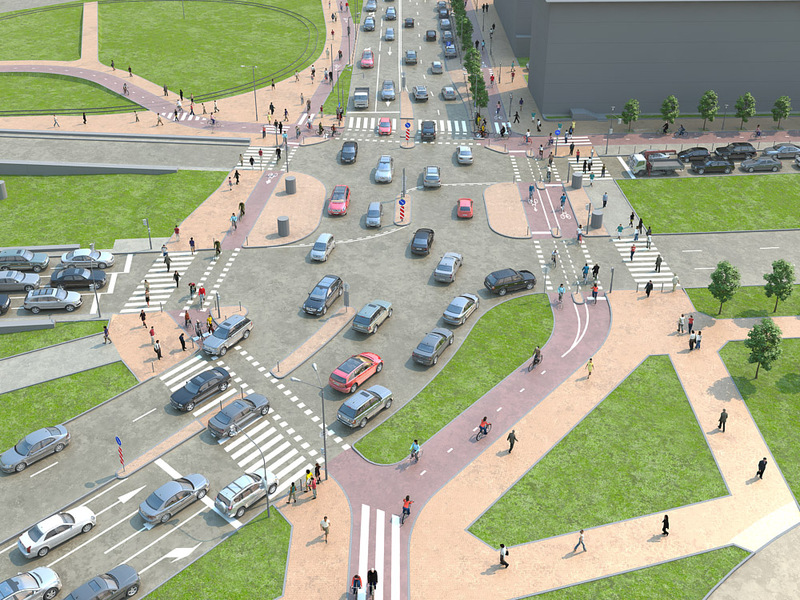 Yekaterinburg town hall published a transportation development plan for the next 3 years. The plan consists of 30 projects of which 28 are road building and widening and only 2 are devoted to public transport. There’s also a remarkable foreword to the plan which states that our city’s congestion problems are caused by the increased income of the citizens. That’s right – folks got rich and bought a lot of cars. 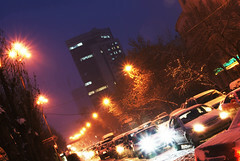 The automobilization level in Yekaterinburg reached 320 cars per 1000 people which make it 2nd after Moscow. This turned out to be too much and the cars stopped fitting in the street space. That is how (according to the city government) Yekaterinburg fell victim of its own success. City officials see the solution to congestion in steet widening, building new road and interchanges, and removing obstacles to car traffic. This may sound logical but in reality it will just make things worse. Increasing the capacity of roads will bring relief only in short term. In the long run however people will see the improvements and start driving more, consuming the new capacity and returning the level of congestion to equilibrium but with more cars on the road. This phenomenon is known as induced demand (or in this case – induced traffic) and characterized by the situation when after supply increases, more of a good (in this case – road capacity) is consumed. This demand could have stayed unrealised or could have been transformed to another kind of demand (transit trips for instance if there were good transit options). 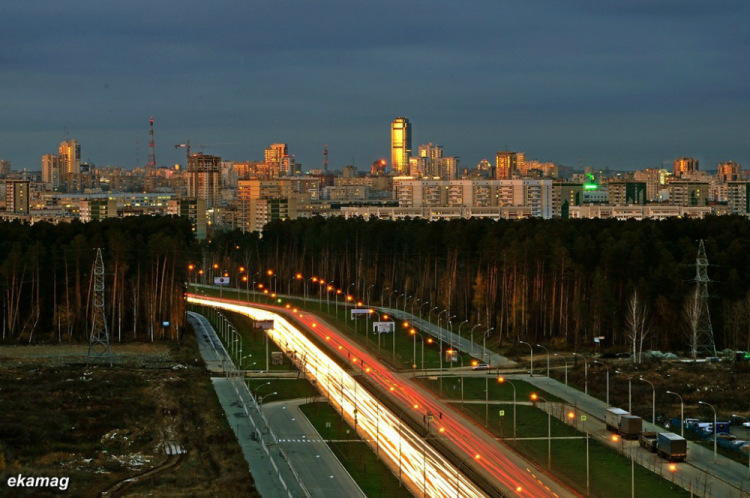 The potential of traffic growth in Yekaterinburg in enormous. Present motorists will easily find reasons to drive more when the roads get widened while the level of car ownership (which is now considerably lower than in average European city) will continue to grow. At least if there’re no improvements in other transportation options. That is why I am convinced that the results of the proposed projects will be leveled by growing traffic in a matter of years. No city in the world have solved the problem of urban mobility by staking on private automobile and there are no reasons why Yekaterinburg could do it (while there’s a number of reasons why it couldn’t). The mental problem of city officials is that they bind car ownership rate to the amount of car trips while in reality they’re only connected indirectly. Owning a car does not oblige one to drive it every day on every occastion. The car is a great invention of the 20th century which seriously broadened the horizons of personal mobility but like any other mode of transport it is not universal and have its own optimal field of use. For very long distances it is impractical for the traveller who would rather prefer a plane or a train, while for short distances (which are most common in cities) it is impractial for the society in general because the dominance of cars in the city harms the quality of life in many ways. Thus, the solution for urban mobility lies in more sustainable public transit and active transportation, reduction of car trips and it doesn’t lie in attempts to accomodate more cars on the streets. The town hall’s list contain some good projects (like interchanges on the beltway which would divert traffic from the inner city) and some bad ones (more pedestrian underpasses on the central streets) but it is more interesting what this list doesn’t contain. 1. Complex modernization of public transport. Only 2 of 30 projects on the list are devoted to transit: dedicated bus lanes and a new tramway line along Serova street. Both are planned for as far as 2013. Besides, the tramway line is not supposed to create new transit options but rather to replace the current straight tramline on the 8 Marta street with a ‘crooked crutch’. The officials say that the tram will duplicate the metro which runs along the same corridor in the the center of the city. But in fact since the tram routes are far more diverse in the tramline network than a single metro line that duplication is going to be marginal. The whole idea is aimed at getting two more lanes for traffic jams consealed as taking care of public transport users. 2. Encouraging active transportation. Yekaterinburg being very compact has a huge potential of becoming a great pedestrian city and a great bicycle city. But at the moment pedestrian infrastructure is financed very poorly while cycling infrastructure doesn’t exist at all. 3. Well-thought parking policy. Every time there’s a discussion about traffic restraints people start it with congestion pricing, a controversial measure which is hard to realize. At the same time an average car spend 95% of its life cycle at a parking place. So, having a guaranteed free of charge parking place at every destination is a major incentive to drive. 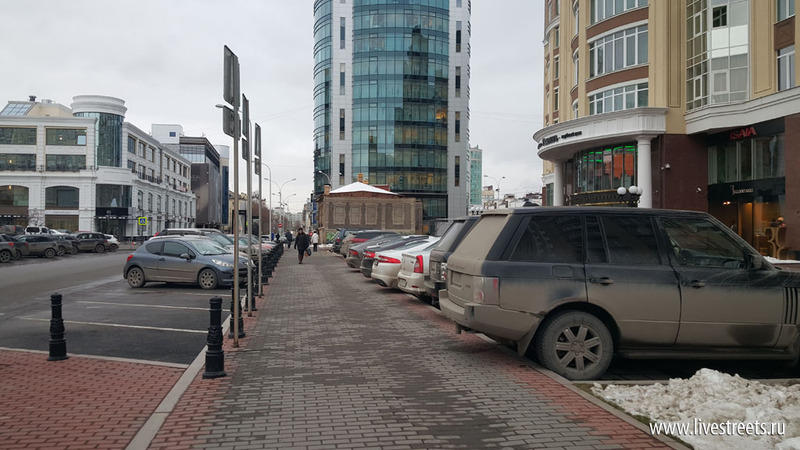 And in Russia ‘guranteed’ doesn’t mean that there are plenty of parking spaces but that it is possible to park without consequences on any driveable horizontal surface on the street. Parking, being free, distorts the real price of a car trip. We haven’t got free apartments, offices or warehouses in the city. At the same time motorists can use a very scarce resource of street space to store their cars for free. Thus, serious street parking restrictions and making the drivers pay for it would be the greatest disincentive to driving. And that’s what the city should start with. Unfortunately these three items would not appear on the town hall’s agenta anytime soon. I get more and more convinced that the city officials tend not to take notice of modern urban planning practices and there’re no people there any close to leaders like Jaime Lerner, Enrique Peñalosa or Michael Bloomberg. Even more sad than this is that because of the recent changes in municipal elections’ legislation we have lost even a theoretical opportunity to change city policies by electing a new mayor. So I guess the present team will keep pushing obsolete projects on our heads for a long time. This entry was posted in Yekaterinburg and tagged planning, townhall, yekaterinburg on December 28, 2010 by Vladimir Zlokazov. Tramway as a form of public transport appeared in Paris in 1855 when French inventor Alphonse Loubat (the man who invented grooved rail) built on of the first horse-drawn lines. As the technology moved forward, steam, pneumatic and finally electric trams came to use. The golden age of the tram was in 1920s. At that time overall length of tramlines in Ile-de-France region was more than 1100 km; there were 122 routes served by more than 3000 trams. The system carried 720 million passengers yearly. Studies were carried to build new lines in the suburbs of Paris but they were never realised. By the end of 1920s the automobilization gained momentum and the car makers along with petroleum companies gained political power. Tramway began being presented and perceived by the public as an obstacle for growing car traffic, a reason of congestion and overall as an outdated form of transport comparing to buses (which were produced and fueled by the same car and oil companies). By 1938 the pressure from the car lobby lead to a series of planning decisions which put an end to one of the most significant tramway networks of its time. Isolated lines in the suburbs were not closed until 1950s. It’s worth mentioning that exactly the same was happening in cities all over the world. As for Paris, it became an example for other French cities to remove tramway lines in favor of growing car traffic. Ironically these smaller cities suffered more than the capital because they didn’t have extensive subway systems to substitute the tram. In 1971 French president George Pompidou stated that “cities must adapt to the car”. For decades, especially after the Second World War, automobilisation was perceived as a symbol of progress and prosperity and extensive construction of car infrastructure (highways and freeways, street widening, huge car parkings) was a priority for local, regional and national governments. But by the mid-1980s, after several oil and energy crisises and because of the growing understanding of the negative impact of car traffic on the quality of life in cities, interest for public transportation started growing again. Rapid transit such as metro and trains requires significant investing and takes a long time to build, therefore tramway as a cost-effective solution appeared on the agenda. The first tramway lines in Ile-de-France region (T1 and T2) were built in the suburbs to the west and to the north of Paris. (Note: almost all the public transport in the capital region is run by RATP operator, so the lines are numbered independently of the municipality in which they’re laid). Tramway line T3 is the first line in the Paris proper and I would like to elaborate on it more thoroughly as it represents not only a modern transportation solution but also an innovative approach to rehabilitation of urban space. This entry was posted in Foreign Affairs, Public Transport and tagged line T3, paris, public transport, tramway on December 23, 2010 by Vladimir Zlokazov. I have spent the end of November in Paris. Of 2 weeks of my visit I’ve been riding a bike for 10 days: to explore the city, to get where I was going, in the morning, in the afternoon, in the evening, in dry weather and under drizzling rain. So I’ve got a lot of cycling impressions in the French capital and I’d like to share them with you. Here we go! First of all I can say that Paris is definetely a bicycle city. What does it mean? It means that cyclists, bikes and bicycle facilities are clearly visible on the streets. People bike to work, to shops and cafés, wearing normal everyday clothes. Almost all the bicycles are city bikes. Road bikes are also present while cross-country ones are almost completely absent. A significant part of bicycle traffic is represented by Velib’ cyclists (parisian bike-share system). Paris has a fairly good system of bicycle routes, connecting major city neighborhoods and suburbs. The authorities of the French capital started taking cycling seriously only in the late 1990s, so Paris is a beginner cycling city, comparing to cities in the Netherlands and Denmark and that makes it an interesting example of bicycle facilities’ evolution since a whole range of them is present: from mere compromise to rather impressive ones. This entry was posted in Foreign Affairs and tagged bicycle infrastructure, paris on December 11, 2010 by Vladimir Zlokazov.